Jean's Quilting Page: And there is a winner! And there is a winner! Thanks to all who are participating in the Red, White and True Quilt Along. 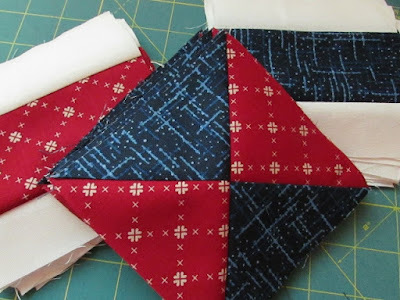 Susan at Hanging on by a Needle and Thread won the beautiful Fabric Spark fat quarter bundle. Check out their Facebook page for giveaways all summer! I wonder what she will make? She is caught up on the quilt along and posted her QST pictures today, so she might have time to start dreaming up the next project. There will be a few more surprise giveaways throughout the quilt along, including a Fat Quarter Shop gift card...so keep up, keep posting and keep sending me pix! After working on the next several steps in the quilt along yesterday, I thought I earned a shopping break, so headed to Omaha to a couple of shops there. I was hunting for a few more black and gray batiks for the new Circle and Spin to the Moon. I found some that will work perfectly, I think! I cut a set of blocks when I got home and plan to get them sewn later. I still have to sew some more colorful minis and then I will be ready to lay them all out and start sewing them together. I have a new project I want to start soon too, so need to get this one finished! I love the small splashes of color in some of them. The houndstooth actually has more color, but I think it will work since it's on a gray base. Mowing first, then some sewing! Are you sewing too? I'll be posting updates on Facebook later, so join in. Congratulations Susan! Enjoy your winnings! Thanks again, Jean! I have a few projects to finish up before I start anything new, but I'll definitely be thinking of what to make with my new fabrics! We all need a little quilty therapy, don't we?